After 10 years of Marvel’s ambitious, unprecedented, interconnected genre filmmaking, Avengers: Infinity War is finally going to give fans everything they’ve ever wanted: a 63-way kiss. Wait, sorry, that’s my personal wishlist. What I meant to say is that it’s going to give us the Avengers fighting against Thanos, who seems destined to complete his mission to collect those cosmic Mancala beads known as the Infinity Stones. They’re not just great for bedazzling a gauntlet; they’re also the most powerful artifacts in the Marvel Universe. But just how powerful are they? Where did they come from? On today’s episode of The Dan Cave, I’m going to give you a brief history of everything you need to know about the Infinity Stones. The Infinity Stones made their auspicious debut in the the pages of 1972’s Marvel Premiere #1, a strange piece of Jesus Christ Superstar fan fiction in which Adam Warlock (whom you might remember as a golden sarcophagus at the end of Guardians of the Galaxy Vol. 2) was given the first Infinity Stone—the Soul Stone—and instructed to save Counter-Earth, an experimental world that was intended to be a utopian version of Earth before things went to hell in a hand-basket. You know, because comics. Back then, though, the Infinity Stones weren’t even called Infinity Stones; they were known as Infinity Gems or Soul Gems, which I think are an inarguably better names. But hey, I’m not Kevin Feige. They are immensely powerful, oblong objects that give the wielder total mastery over an aspect of the universe that they represent. When wielded together in that delightful golden glove known as the Infinity Gauntlet, they give its wearer total command over reality as we know it. As revealed in Thanos Quest #2, the gems were originally part of an all-powerful, sentient being of limitless power, later referred to as Nemesis. At the time, Nemesis was the only living being in all realities. It was an incredibly lonely existence, so eventually it killed itself and was reincarnated as the six Infinity Gems. Each gem became associated with a different face of existence: power, space, time, mind, soul, and reality. The origin is a bit different in the the Marvel Cinematic Universe, where the Infinity Stones were created thousands of years ago by the four Cosmic Entities: Death, Entropy, Infinity, and Eternity. You might remember them from that sweet temple vault on Morag where Star-Lord first found the Orb containing the Power Stone. From here on out, I’ll be calling them "stones" because that’s the current MCU parlance, even though "gems" is objectively cooler. Their colors have changed over the years, most notably with 2017’s Marvel Legacy, which retconned them to better reflect the movie continuity. But one thing remains the same: each stone possesses unique, devastatingly powerful abilities, so let’s explain how they work. Originally blue in color and now yellow in the comics and the MCU, this stone allows the user to greatly enhance their psionic abilities like telepathy or telekinesis. When used in concert with the Power Stone, you can access all of the minds in existence simultaneously. In the MCU, it was hidden inside of Loki’s scepter, which he used to mind control people like Hawkeye and Dr. Erik Selvig, and was later used to bring the Vision to life in Age of Ultron. And I’m sure nothing bad will happen to it in Infinity War. No, it doesn’t transform all television into The Bachelor...but it could. Originally yellow in color and now red, the Reality Stone allows its wielder to bend the laws of reality to their will. For example, you could make it so that 2 + 2 = 5 or that "orange" rhymes with something or give Kyle Hill frosted tips and a monocle. In the MCU, it is known as the Aether, a liquid able to convert matter into dark matter and empower its host. During Age of Ultron, Thor had a vision in which the liquid solidified into the Reality Stone. When powered up, it grants control over all of reality as we know it. It’s right there in the name! This bad boy gives you incredible amounts of power. Originally red and now purple in the comics and the MCU, the Power Stone grants the user enhanced physical strength and endurance, and allows them to manipulate energy. It also enhances the abilities of the other Infinity Stones. In the MCU, the Power Stone was stored inside the Orb, an ornate containment unit that was discovered by Star-Lord in a temple on the planet Morag. When fully powered up, it imbues the owner with omnipotence. This Nasty Larry allows the user to bend the fabric of space to their will, thus making interdimensional travel possible by opening gateways between disparate points in the universe. The stone—originally purple and now blue—is contained within the Tesseract in the MCU, and was most famously used by Loki to open a portal through which the Chitauri forces invaded New York in 2012’s Avengers. It can also grant the user super speed and, when it is in its most powerful state, it gives the user omnipresence, the ability to be everywhere at once. Previously orange and now a resplendent shade of green, the Time Stone is pretty self-explanatory: it allows the user to manipulate time by accelerating or reversing its flow. In the MCU, it is housed inside of the Eye of Agamotto, which is Doctor Strange’s version of a Millennium Puzzle Piece. It also gives its wielder the ability to see into the past and the future, as well as travel through time, control people’s aging, and, as we saw Doctor Strange do to Dormammu, trap people in endless time loops, like some sort of Vine of the Damned. When fully powered up, it gives the owner complete control over the past, present, and future, as well as omniscience. Originally green in the comics and now a lovely orange, the Soul Stone is the only Infinity Stone we have yet to see on the big screen. Everyone has their theory as to where it could be in the MCU—maybe Idris Elba’s Heimdall has it? Maybe it’s in Wakanda? Maybe the real Soul Stone was the friends we made along the way? Regardless, this powerful object allows its owner to manipulate the souls of the living and the dead. It also acts as a gateway to a paradisiacal pocket dimension where souls can be trapped. 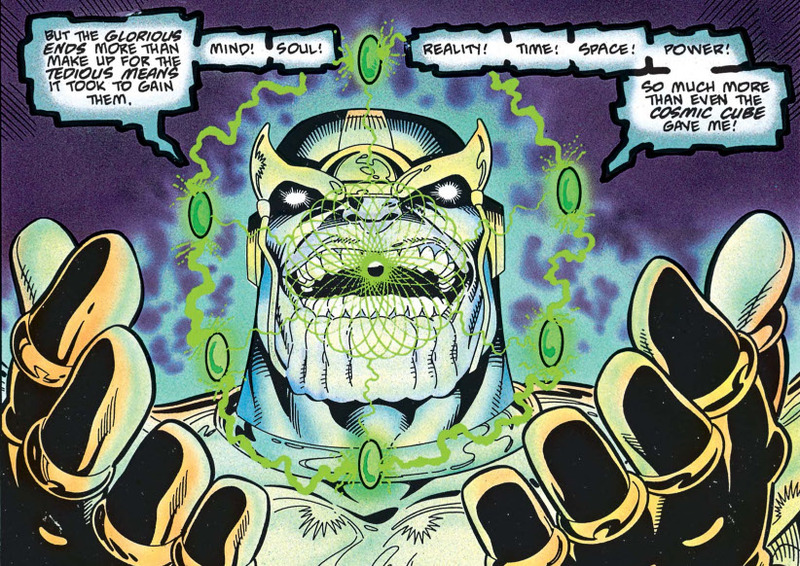 Arguably the most dangerous of the stones, the Soul Stone in the comics is sentient and thirsts for more souls. If one isn’t careful, the Stone can possess you and bend you to its will. When fully powered up, it grants the user complete control over all living beings in existence. The Infinity Stones were first assembled by Thanos during the 1990 Thanos Quest and 1991 Infinity Gauntlet mini-series. Thanos isn’t just like a magpie, attracted to shiny things, though. He gathered all the stones, amassing godlike power in the process, in order to impress his crush, Mistress Death, who as you may have guessed is the personification of Death itself. You can learn more about that and his weird love triangle with Deadpool in another The Dan Cave episode I did previously. In Infinity Gauntlet, Thanos uses his powers to brutally murder half of the living beings in the universe in order to restore “balance” to the universe. This, in turn, leads Adam Warlock to assemble Earth’s surviving heroes and launch an all-out assault on Thanos, which is full of intrigue, betrayal, murders most foul, and—spoiler alert—Thanos eventually living a simple life as a farmer. Most recently, the stones returned, deadlier than ever in Marvel Comics’ ongoing Infinity Countdown storyline. Where they’ll wind up, nobody knows, but smart money is on Thanos’ hand. You know, because vertical integration. On the big screen, though, Thanos and his goon squad known as the Black Order/Children of Thanos are going to give Earth’s Mightiest Heroes a run for their money as everyone’s favorite Crossfit California Raisin tries to assemble the Infinity Stones for his own sinister ends. Like permanently killing Captain America. Sorry guys, it’s gonna happen. Anyway, that is everything you need to know about the Infinity Stones. Or Gems. Or shinybois. Whatever you want to call them. Which Infinity Stone would you most want to possess? Who is gonna bite it in Infinity War? Let me know in the comments below. Who should John Boyega play in the Marvel Cinematic Universe? Did Benny the Jet actually steal home at the end of The Sandlot?